Netgear is broadening their offering of mesh WiFi Range Extenders with the Nighthawk X4S Wall-Plug AC220 Tri-band WiFi Range Extender. 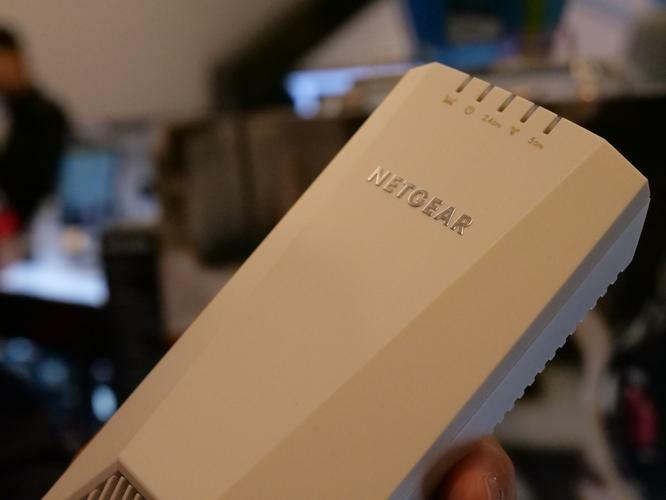 “If you love the advanced features of your current router or are locked into the modem-router provided by your ISP, the nighthawk X4S Extender with FastLane3 Technology offers you an easy way to extend your home WiFi by adding a mesh network without overhauling your network,” said David Henry, Senior Vice President of Connected Home Products at Netgear. The Nighthawk X4S has a stylish, compact wall-plug design that is effortless to install and blends easily into a room. It also touts Smart LED indicator lights on the front that help guide you to the optimal location to place your extender to enjoy the best WiFi coverage. The company say that their patented Fastlane3 Technology here allows you to experience Nighthawk Mesh capabilities while keeping the same WiFi network name (SSID) and password for your entire home without the reduction in WiFi speed rating that comes with traditional WiFi extenders. Originally introduced in the company’s popular, award-winning Orbi Ti-Band Home WiFi System, enables Tri-band WiFi to create a dedicated wireless link from the extender to the router, removing bottlenecks for your home network so that smartphones, tablets and computers can stream, game or browse the internet. The NETGEAR Nighthawk X4S Wall-Plug AC2200 Tri-Band WiFi Range Extender is available now for $279 at major retailers.